Whenever I am being asked about my favorite British recipe, I always answer that it has to be an Indian dish! 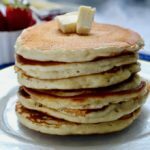 The British have also imported a number of recipes from their colonies and overseas territories, like Gibraltar, the Cayman Islands or Bermuda for example. But the cuisine of India is definitely the one that has marked British cuisine the most over the past 4 centuries. There are now more than 9400 Indian restaurants in the UK, with almost half of them in London and its vicinity. Chicken tikka masala is actually the most favored dish by the British! My first visit to the UK was in the 80s as I stayed a couple times with a family in Bognor Regis, on the southern coast of England to study and practice my English during the summer. In the late 90s, I used to work for a California-based company. Their European headquarter was located in the London suburbs. Also, my brother and his family lived in London for 12 years in the 2000s. Although I visited London quite often, I always ended up eating Indian food over there. They definitely have some of the best Indian restaurants in the world. I was never attracted to British cuisine, but there is one dessert I have fond memories of. This dessert is trifle! 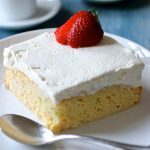 The word trifle comes from the 14th century Anglo-French word trufle, which means fraud or trick, and let me tell you, it’s definitely more of a treat that a trick! 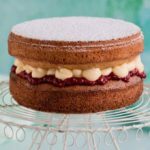 In a nutshell, it is egg custard poured over sponge cake soaked in fruit and sherry and topped with whipped cream. 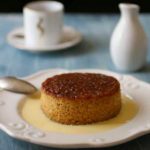 In the American South, it became popular among the plantation owners and was often called Tipsy Cake or Tipsy Parson. Buxton Pudding and Tipsy Hedgehog, a Victorian version with almonds used for the spines, are also famous variations of the same dessert. 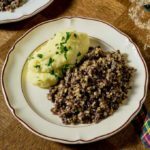 Tipsy Laird is the Scottish version in which the cake is soaked in Drambuie or Whisky. Trifle is traditionally made with Savoy cake, usually stale, which allows the cake to absorb more of the liquid. 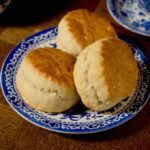 Some recipes, like the one I am proposing, make use of Savoy biscuits called Savoiardi, the Italian version of ladyfinger biscuits. 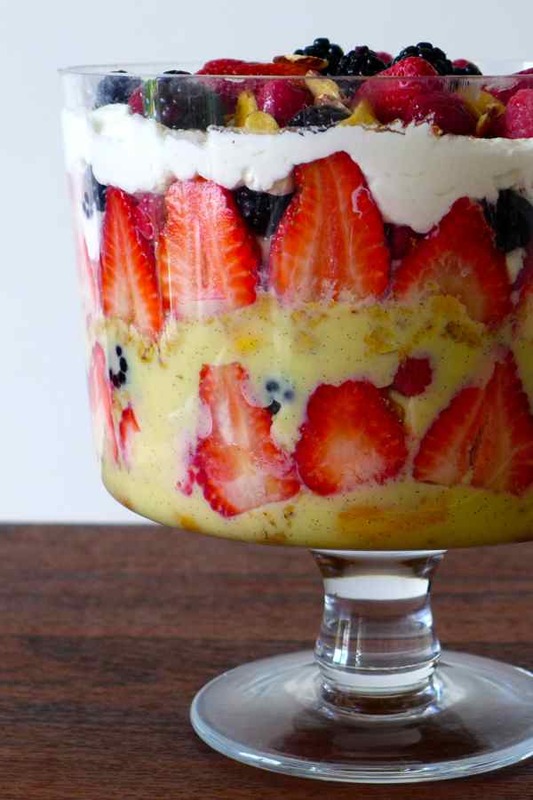 Trifle historically evolved from an old British dessert called fruit fool or foole, which only included sweet custard and pureed fruit, originally gooseberry. 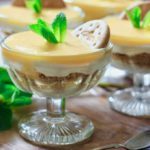 Another British ancestor of the trifle is the syllabub, which was milk or cream, curdled by an alcohol such as wine or cider. 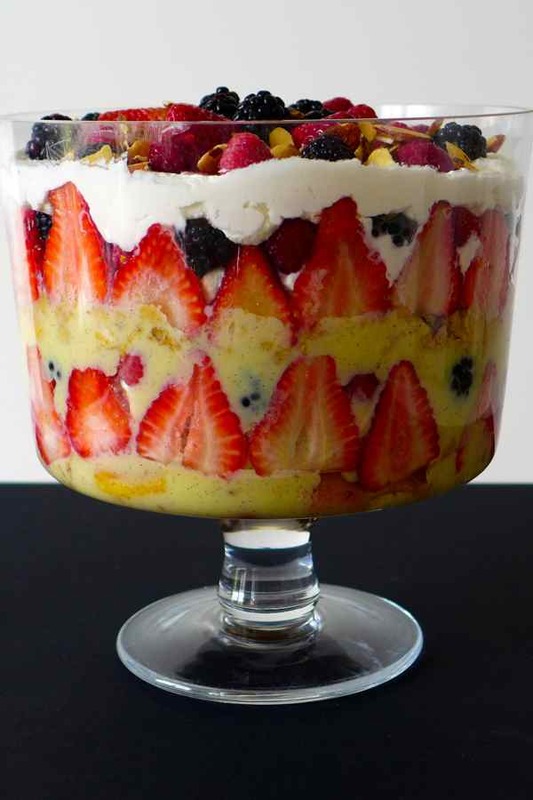 Trifle is at the origin of zuppa Inglese (English soup), the popular custard dessert introduced in Italy in the late 19th century in which Italian liquor Alchermes replaces Sherry and Brandy. There is not one recipe for trifle but thousands. Every country and region added its own touch. Food writers Helen Saberi and Alan Davidson wrote up the history of this dessert in 2001 in a book called Trifle! A single dessert. Thousands of possibilities! Fruits: fresh, pureed fruits or compote can be used. 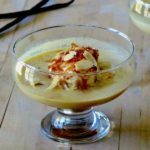 Custard: homemade custard is used for festive occasions. Bird’s instant custard is a generally accepted alternative and has even become traditional in the UK. I happened to travel to Boston this week (after I made the trifle) and found some Bird’s custard in a British specialty shop. I will definitely try it out and post my impressions in the next few weeks. Toppings: you can go crazy but the typical toppings include crushed Amaretti cookies, toasted nuts, candied fruits and shaved chocolate. I used famous French biscuits Gavottes and toasted almonds for my recipe. Trifle bowl: this bowl has become the emblematic container of the traditional sweet British dessert. I got mine at Crate & Barrel. I spent almost 2 weeks in Paris last month and I brought back a number of goodies from there. Among those goodies were a lot of French cheeses. 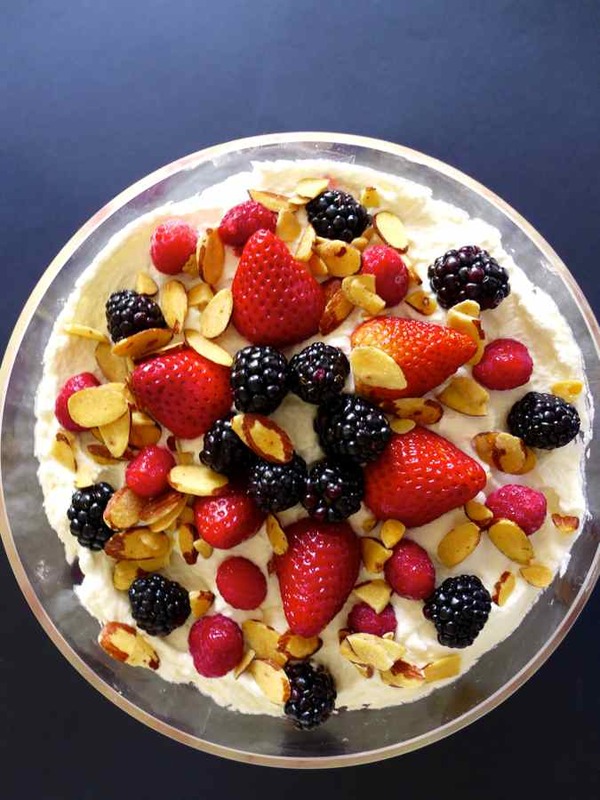 And since my friends know me so well, I had to organize a cheesy party to celebrate me getting over the hill as I turned 41… although some would say I am already over the hill… On the menu were cheeses, artisan breads, salads and… this trifle! This trifle was definitely a hit if you can judge by the fact that it was finished in less than 15 minutes… or maybe some of my friends who hate cheese could not wait for the dessert. Either way, I can tell you that it was delicious. Sweet but not too sweet. Crunchy with the addition of the crushed Gavottes and toasted almonds. Festive with the heavy touch of Sherry and Brandy. Delicate and sophisticated with the Savoiardi. The berries gave the sour touch needed to make this dessert my new favorite dessert on 196 flavors so far. Despite the thousands of recipes for this sweet traditional dessert, there are still some common guidelines to follow to make an authentic British trifle. Heat the milk and heavy cream in a saucepan over medium heat and bring almost to a boil. Remove from the heat. Beat the egg yolks and sugar in the bowl of an electric mixer for about 5 minutes until pale and thick. Add the cornstarch. Beat on medium-low speed until combined. Slowly pour the hot milk mixture into the egg mixture. Pour the mixture back into the saucepan. Cook over low heat, stirring constantly, until the mixture thickens, for about 5 minutes. Pour the mixture through a fine sieve into a large bowl. Stir in the Sherry. Place plastic wrap directly on the custard and refrigerate for about 30 minutes until cold. Beat the heavy milk in the bowl of an electric mixer for a few minutes. Add the Brandy and continue to whip until stiff. Separately, beat the egg whites until reaching soft peak. Fold in beaten egg whites into the whipped cream. Thickly slice strawberries and set aside with the rest of the berries. Mix toasted almonds and crushed Gavottes in a bowl. Add the zest of 1 lemon to the almond mixture. Place Savoiardi biscuits at the bottom of the bowl. Top with a layer of berries and custard. Sprinkle toasted almonds and Gavottes mixture. 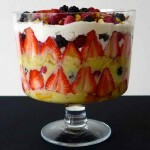 Repeat with 1 or 2 layers of Savoiardi, berries, custard and almond mixture depending on the size of the trifle bowl. Garnish with toasted almonds and a few whole berries. This looks heavenly! Definitely voting for this one! This is one of my favorites because of the fresh fruit. 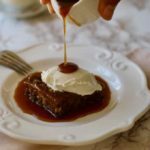 It looks delicious and would be the perfect dessert for a family get together. I love trifles and this one looks and sound amazing! This one gets my vote! UK: Trifle Nothing more scrumptious than a well made trifle for dessert! 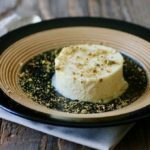 Like this recipe shows, it is very versatile and always a welcome surprise. That looks and sounds great, Im drooling just from the picture! Looks like it would be the crowd favorite! This looks so amazing!! I have to make this!! Wow! The Tipsy Hedgehog sounds like the one for me. I have a trifle dish. I need to get to work on this one. Just love it . Originally tried a recipe from New Zealand and can’t wait to try this one. A favorite desert of mine. 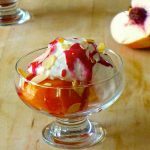 Votre trifle est tout à fait “LE” bon, avec la touche créative en plus qui ne fait pas de mal… Sur la cuisine, sinon anglaise, du moins britannique, je crois toutefois que vous devriez dépoussiérer un peu de lieux communs. 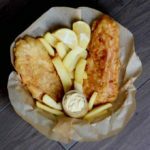 Longtemps délaissée, la cuisine familiale est très intéressante, surtout quand on cherche du côté des plats régionaux. Allez, faites-nous une série UK et vous aurez des surprises ! I am making this for a get together with friends. How far in advance can this be made and stored in the refrigerator? Hey Deb, I wouldn’t keep it more than 1 day to be honest, as the biscuits will become way too soggy. Enjoy! Ok, I’m thinking I will make the custard and whipped cream today,store in fridge; assemble tomorrow, refrigerate a couple hours and then transport to party. Mike, your trifle was a hit, all loved it. It was great to have the custard and whipped cream done the day before to save time. Thank you for a great dessert! Nice! Glad it was a success!